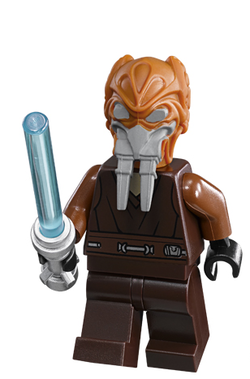 Plo Koon is a LEGO Star Wars Minifigure. He was a Jedi Master who served the Republic during the Clone Wars. To date, Plo has appeared in three sets and two LEGO Star Wars video games. The Minifigure features a rubber-mould head consisting of two colours: orange for his face, and grey for the goggles and mask that the Jedi wears to protect himself from the rich oxygen his species is not able to metabolize. The torso features a dark brown Jedi tunic, with lighter brown arms and black hands, and has brown legs matching his tunic. Plo Koon is known to have had only one accessory- a blue-bladed lightsaber as seen in the 7676 Republic Gunship. To date, Koon has been released in one form, which has appeared only in the Clone Wars subtheme. Plo Koon as he appears in LEGO Star Wars: The Complete Saga. Prior to his release in Minifigure form, a video game Minifigure of Plo was made for LEGO Star Wars: The Complete Saga. This figure had a lighter skin tone and tunic than his physical Minifigure, and his head was wider. Plo is armed with a blue-bladed lightsaber, can use the Force to attack, build, and manipulate objects and perform double-jump. Plo Koon also appears in the video game LEGO Star Wars III: The Clone Wars as a playable character. This time around, his appearance is based on that of his physical minifigure. He is present in story mode in the level "Destroy Malevolence". Like all other Jedi characters in the game, Plo has the ability to perform a lightsaber throw, destroy certain walls and enemies which only lightsaber wielders can, and jump up pairs of walls by jumping at one wall and burying his lightsaber in it, then leaping to the other. Plo Koon also had a cameo in LEGO Star Wars: The Padawan Menace. Inside Mos Eisley Cantina, he pulled down C-3PO's Jedi cloak, thus revealing him to be a droid and getting him kicked out of the cantina. Plo Koon was a Kel Dor Jedi Master, and was a leading member of the Jedi High Council for many years. Throughout his lifetime, Master Koon was known to have carried out several missions for the Jedi Order and Galactic Republic. Plo Koon was in command of the closely knit clone squad known as the "Wolfpack", led by Commander Wolffe. Plo was known to have been a formidable opponent both on land with his lightsaber and in space. During the Clone Wars, Plo flew several missions in his personal starfighter, many of them with his astromech droid R7-D4. At the conclusion of the Clone Wars when Order 66 was initiated, the Jedi Master was shot down in his starfighter by Captain Jag and his Clone Pilots on Cato Neimoidia. In early preliminary box art of the 8093 Plo Koon's Jedi Starfighter, Plo Koon was shown with a green-bladed lightsaber. This was however changed to a blue-bladed lightsaber in subsequent images and final release. Plo Koon wielding his lightsaber. This page was last edited on 27 May 2016, at 12:13.